The clubhouse at Central Parke at Victoria Falls offers exciting amenities to encourage an active social lifestyle. Central Parke at Victoria Falls welcomes active adults with fabulous on-site amenities, as well as a prime location within easy access of urban centers like Baltimore, Annapolis and Washington D.C. Its scenic setting in Laurel, Maryland, features landscaped grounds with beautiful touches like the gazebo park and gardens. With plans for just over 600 homes, this community offers plenty of diversity along with the benefits of a close-knit neighborhood. In Central Parke at Victoria Falls, homebuyers have their choice of available resale and new construction residences in condominium, attached villa and single-family home styles. These beautiful homes are being developed by four home builders: Craftstar Homes, Drees Homes, Michael Harris Homes and Sturbridge Homes. Upon completion, the community will include 112 single-family homes, 247 attached villas and 250 luxury condominiums. Condominiums within the community were built by Sturbridge Homes and are spread across ten buildings, each with elevators and garage parking. Condos have open floor plans and upscale features, such as 9-foot ceilings and spacious master bedroom suites. Two-story attached villas, built by Craftstar Homes or Drees Homes, also feature luxury touches like gourmet kitchens, sunrooms and hardwood floors. Floor plans include two bedrooms and one-car or two-car garages. Single-family homes in Central Parke at Victoria Falls are built by Michael Harris Homes. These two-story homes are designed for main-level living with appealing master bedroom suites on the first floor. Homes are available in three models, each featuring two to four bedrooms, two to three bathrooms and a two-car garage. Highlights include covered entries, bay windows, two-story foyers and vaulted ceilings. The community’s social and recreational activities are centered around the 13,500 square-foot clubbouse. This beautifully appointed facility has amenities designed to support an active adult lifestyle. The state-of-the-art fitness center features cardiovascular and strength-training equipment, as well as an indoor pool and spa. Social areas include multipurpose meeting rooms, billiard and card rooms, a library, a business center and a spacious ballroom. Residents can also express their creativity in the clubhouse’s arts and crafts studio, or get back to nature in the gazebo park and gardens. The grounds offer miles of walking and biking trails, as well as sports courts for tennis and basketball. There is also a casual cafe overlooking a scenic one-acre lake. Beyond its on-site amenities, Central Parke at Victoria Falls appeals to active adults for its fabulous Prince George’s County location. 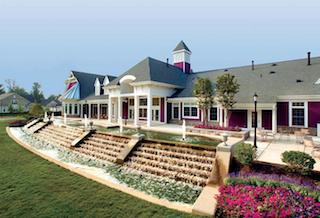 The community is within 30 miles of popular destinations like Baltimore, Annapolis and Washington D.C.
With so much to offer, Central Parke at Victoria Falls may be a dream destination for Maryland active adult retirees.